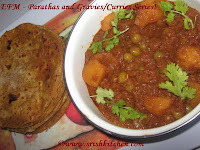 Carrot Chapati And Paneer Butter Masala..
1)Mix all ingrediants and make a soft dough. 2)Divide dough into small balls and prepare like chapati. 3)Fry the paratha and apply ghee on both sides. Serve hot with curd or any gravy. 1. First cut the paneer into medium flat pieces and keep aside. 2.In a small pan roast coconut till the colour changes . 3.Make a fine power of coconut ,cinnamon stick,clove and cardamom in a mixture. 4.Heat 2 tablespoon of butter in a heavy bottom pan. 5.Add bay leaf , then onion paste and fry it for sometime, then add ginger-garlic paste and again fry till the colour changes to golden brown. 6. Add chill powder, turmeric powder , all masala powders and salt to taste and then add tomato puree , fry 2 minutes. 7. Add milk and fresh cream and keep it on low flame for 2 minutes ,if required add water. 8. Add paneer and remaining butter and garam masala to the gravy . 9. Garnish with chopped coriander .